For quite a while now I am toying with the idea to take part in the End of Month View - meme hosted by Helen Johnstone at The Patient Gardener's Weblog. I feel drawn to the idea of reporting about your garden or an area of your garden monthly, which is what this meme is about, to actually see how things are changing, what is blooming when and what needs improvement. When I look at my blog it becomes clear, that I don't do that so regularly and I think it will be fun and I will learn a lot. Somehow to report about my whole garden on a monthly basis feels overwhelming to me, but there is one central bed in the backyard, that I call The White Garden Bed, which would be an ideal candidate for this meme. To be honest with you, I am tinkering with this bed for quite a while now and I am never really satisfied. So I hope, taking part in the meme and for that reason bringing more attention to it, will get me closer to my vision that I initially had for this part of the garden. So with no further ado I will take the plunge, dive into this meme and see where it leads me. Here it is: My White Garden Bed! When I analyze the photos what stands out immediately is, that despite its name, there is hardly any visible white color to see in the bed at this time of the year. Secondly there is a big gap between the cycad on the right and the palm fronts to the very right just barely hanging into the picture. Thirdly the bed looks relatively bare. All three things are really bugging me and I want to change them. This year I want to plant more white flowering perennials and/or annuals and ideally have something white blooming each month of the year. I also intend to fill the big gap to the right side. There will go another Hybrid Tea rose from my pot ghetto, but I haven't decided which on yet. 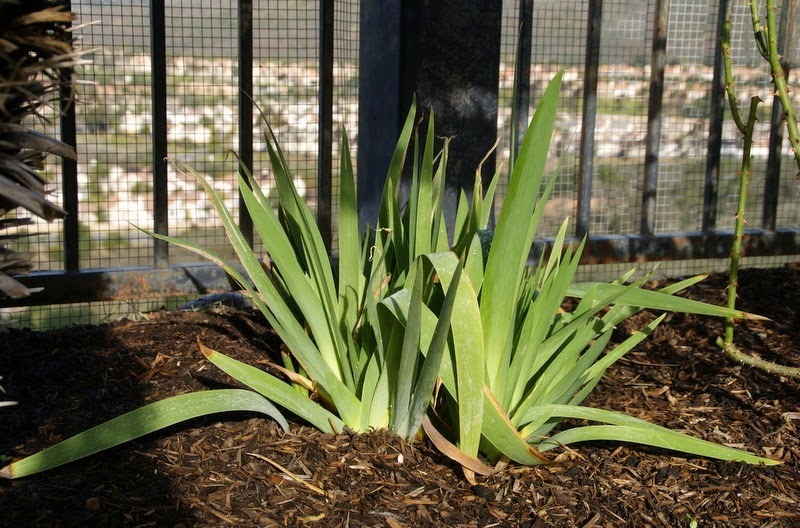 Lastly I would like to plant this bed more densely so that not so much bare soil is visible anymore. Same bed seen from the other side. There are four roses planted in this bed, which don't have much impact right now, but will take on center stage later in the year. The rose varieties from the left to the right are: 'Pope John Paul II', 'Chandos Beauty', 'Moonstone' and 'Auckland Metro'. 'Pope John Paul II' isn't deleaved and pruned yet, whereas the other three are and they are leaving out already again. That is why they look more "see through" on the photos. Here I have zoomed in on the central part of this bed. You can see how vigorously the rose in the middle, 'Moonstone', is leaving out and that there is actually something white blooming on the right side between the cycad and the rose to the very right. 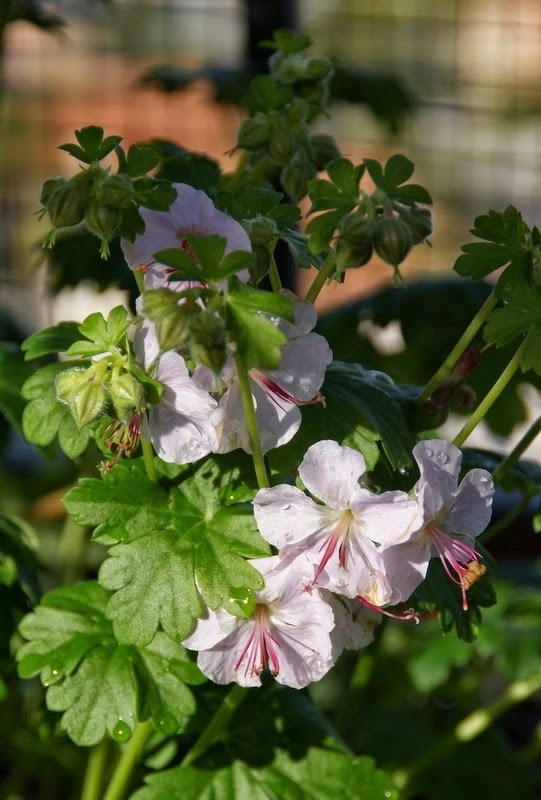 What is flowering there is geranium x cantabrigiense 'Biokovo', which I had planted only last year. It has formed a very nice clump and started blooming just very recently. I really love the dainty cheerful white flowers with a light pink hue. 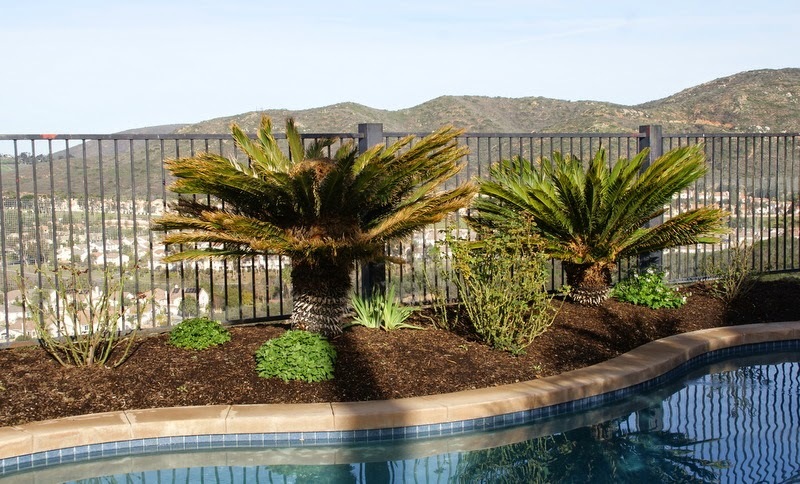 There is another clump of geranium 'Biokovo', seen on the photo above, planted in the bed to the left side of the other cycad, which almost looks like a different plant. 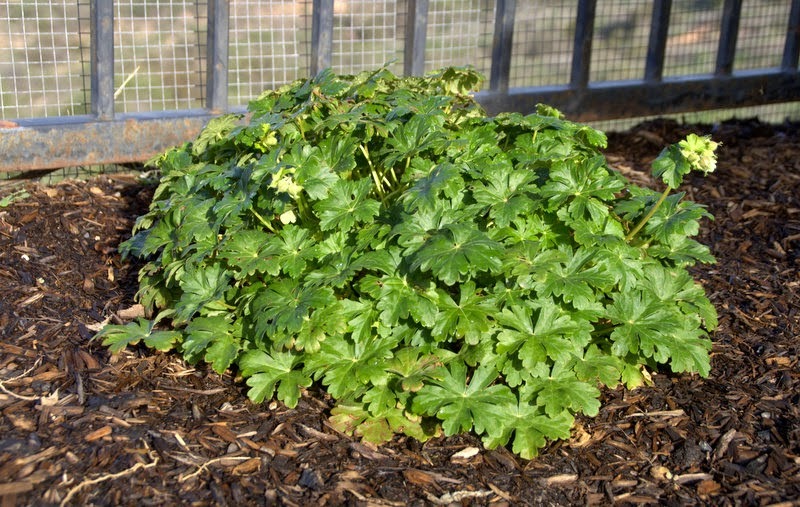 The leaves are smaller and the plant is not as tall, more a "ground huger". It is also not flowering, yet, but if you look closely you can spot a few buds as well. I have treated both geranims exactly the same way, the only difference is that the one you can see on this photo is growing in more sun. 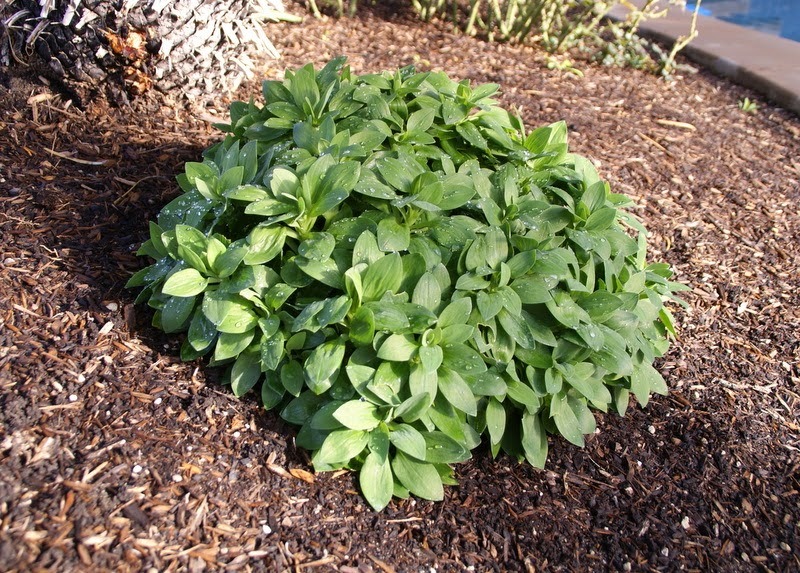 A plant that I have high hopes for is this alstroemeria Princess Lilies 'Claire'. 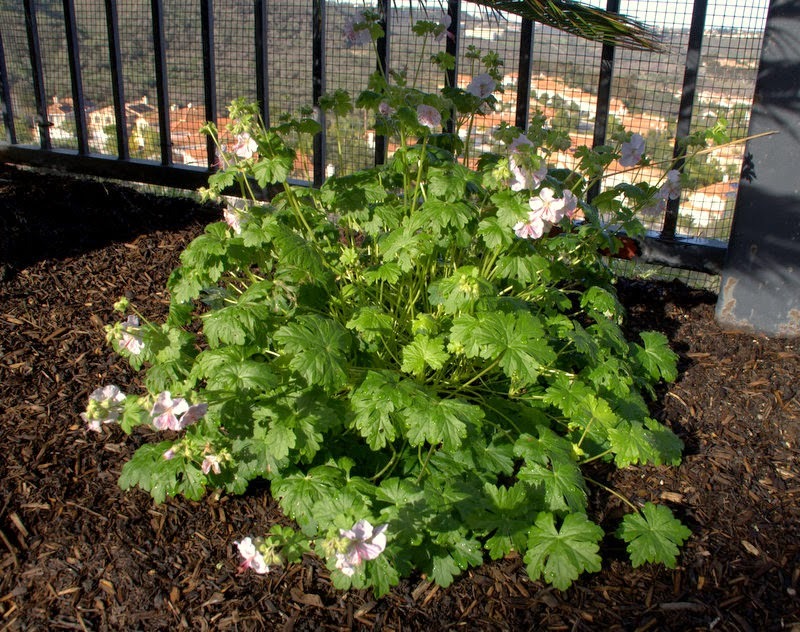 I planted it last year and have not seen it flowering in the ground, yet. As far as I recall it had a vanilla white color, when I bought it. The clump looks pretty healthy, lush and vigorous. I can't wait to see it flowering again. Close-up of the new foliage of 'Moonstone', a Hybrid Tea rose. I love it when the foliage looks so fresh and unblemished when the rose has just leaved out. It appears a little bit of a light color though and I think the rose needs fertilizer. ... than the other, but both are not doing really well. 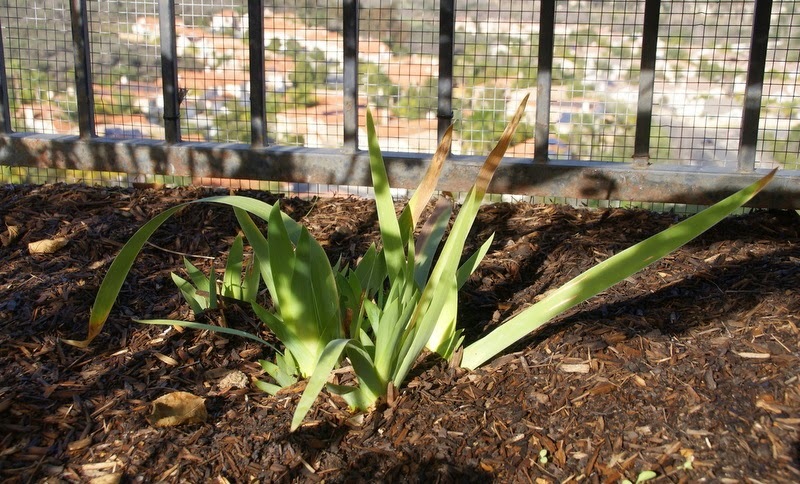 Unfortunately I have made the experience repeatedly that somehow irises don't like my garden very much. I will give these two one more year and see how they do. I still love the white column with the silver gazing ball as much as in the moment my husband and I positioned it in White Garden Bed a few years ago. What I don't like so much though, is the lamb's ear to its feet. At this time of the year the foliage appears rather ratty. 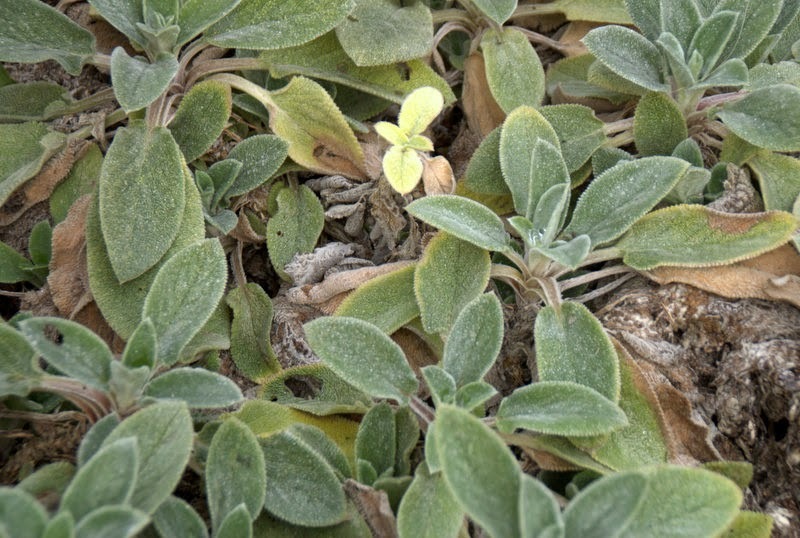 Here is a close-up of the foliage of the lamb's ear. I don't recall the name of this particular variety, but this one can't stand up well to our heat and drought. I believe there are others out there, which are more suited for my climate. Maybe at a certain point it is worth to replace it, but at the moment this is not a task high up on my to-do list. I can't wait to plant some more things into this bed, but I know with our ongoing drought and my poor soil my first chore must be to fertilize and mulch all the existing plants in this bed to give them the best chance to look good this year. Only then I can start planting new plants. Hope next month there is some progress to see and maybe some more white color! Many thanks to Helene for hosting this meme, I am so excited to participate this year. 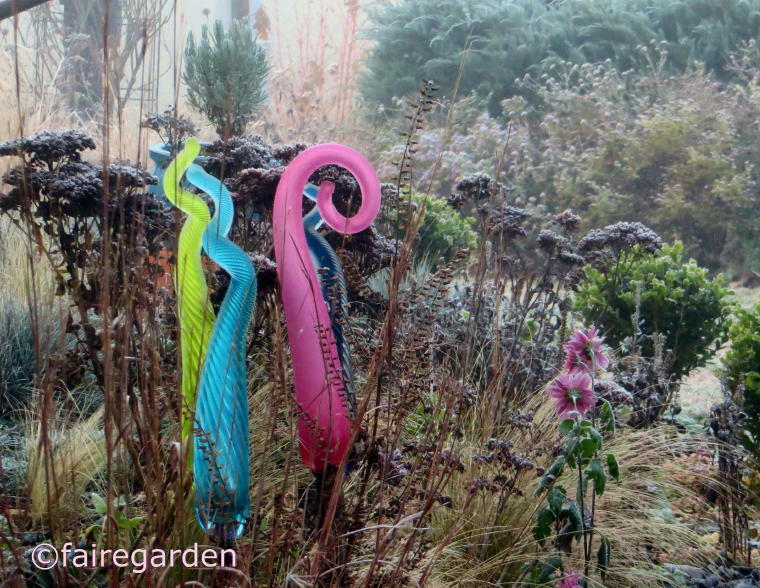 Please, go over to her blog The Patient Gardener's Weblog and check out what other gardeners have to show this month! 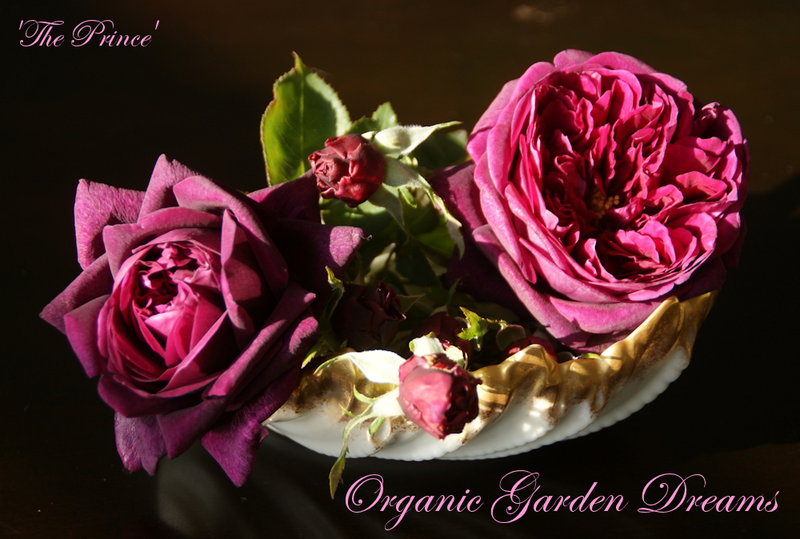 There weren't that many roses blooming in my garden in December 2014 in comparison to the years before. I think, the ongoing drought, that we are having since a couple of years here in California, is taking a toll on my rose bushes. In general many don't seem to be so vigorous anymore and some, that bloomed in December in the previous years, were not able to produce a single flower this year. 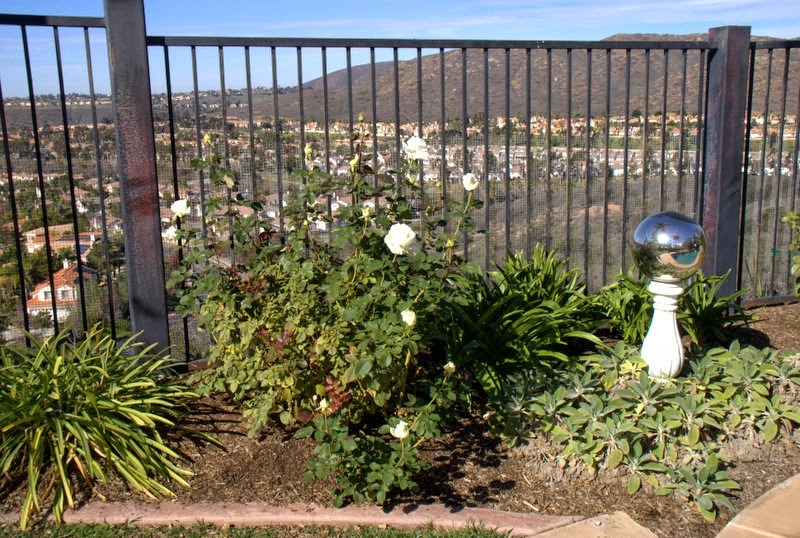 Contributing to the stress that the drought is causing to the roses is the fact, that we have pretty tough mandatory water use restrictions effective since November 2014 in San Diego. 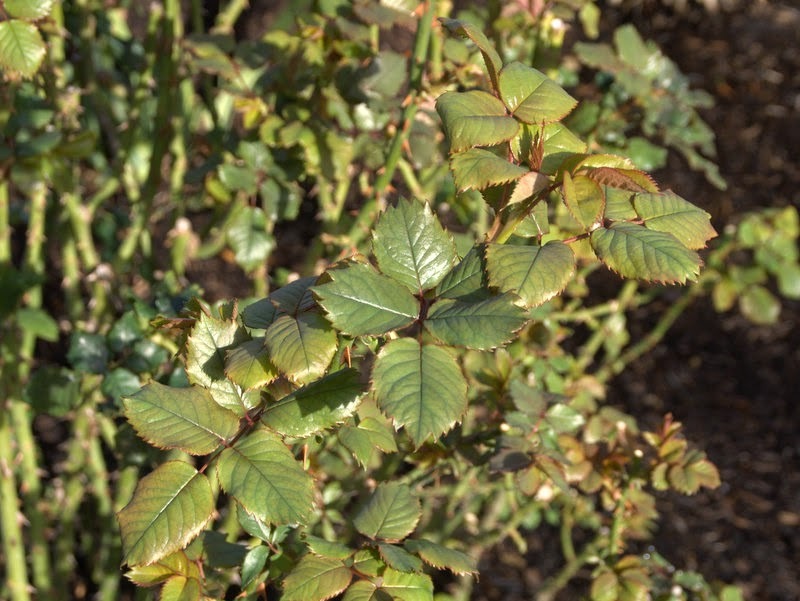 For time reasons, I have only been able to fertilize part of my roses a third time in autumn last year, which is another limiting factor in my poor soil in terms of the ability of the roses to bloom. That being said, I guess it is understandable that the blooms that I got last month were even more precious to me. I would like to share the best ones them with you. This photo of 'The Prince' is my favorite picture from those that I have taken last month. It was shot on a very chilly morning (for California circumstances that is!) and the air was humid with fog and the light was pale and grey, like you only find it in the winter time here. I think, this particular light shows off the deep saturated, sumptuous burgundy red colors of 'The Prince' the best. They remind me of a very good old red vine. 'Frederic Mistral' also gave me some flowers. The fragrance of this rose is wonderful! Another rose that came up with some perfect blooms was 'Sweetness'. On this photo you can see a bush shot of 'Pope John Paul II'. It is not the very best picture, but I hope you can make out how many buds the rose was still producing at that time of the year. It was enough to cut a Christmas and a New Years bouquet and enjoy the blooms indoors. That was such a treat! This rose was fertilized in October and I gave it some extra grey water from the kitchen and the bathroom and these two things together made all the difference. In comparison to my other roses it was the most floriferous bloomer in December. 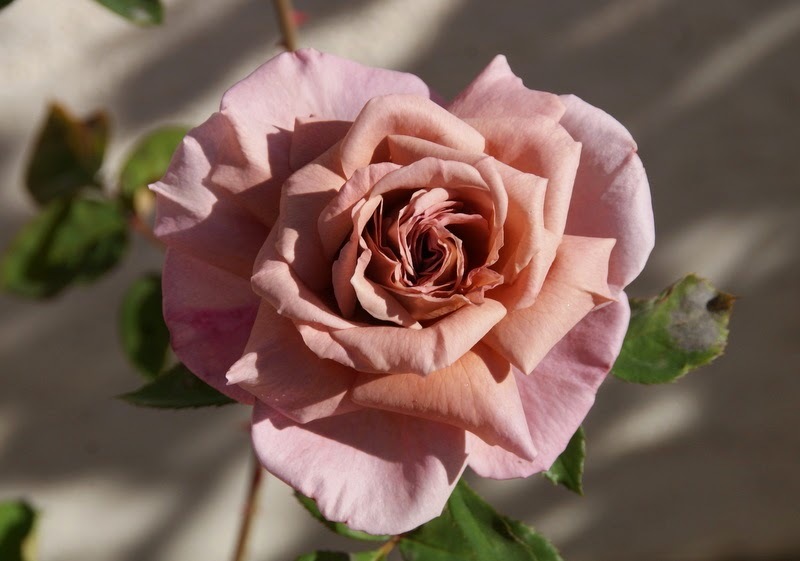 To my surprise, one rose that also produced quite a few exquisite flowers in its unique smoky, brown, russet shades was 'Nimbus'. This rose is still growing in a two gallon container and therefore I could move the pot around to photograph the blooms with the pool providing a blue/turquoise background. Here you can see a bloom that is more open. I love this image as it has captured the subtle shades of the coloration of 'Nimbus' very well. Same bloom as in the photo above, but hit by the winter sunlight and with the pool as a background. It is fascinating to me how much light and background colors can change the overall appearance of a rose. One last shot of 'Nimbus'. I just love its color! It makes me forgive that this rose suffers from powdery mildew from time to time in my organic, no-spray rose garden. It is not too bad though, so far. Because of the drought I have drastically reduced my new rose purchases. As a matter of fact, last year I bought only one rose. I tried to order a second own root specimen of 'Pope John Paul II' from Jackson & Perkins. 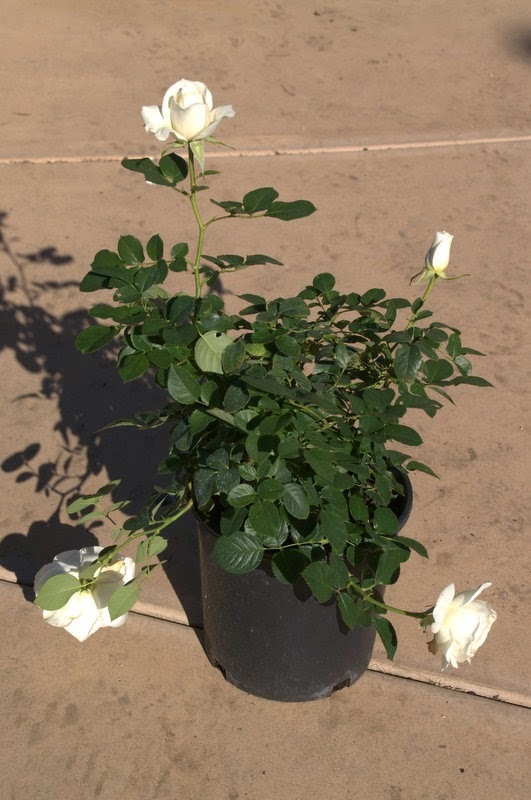 They delivered a healthy looking rose and I didn't realize it in the very beginning, but soon the leaves seemed to be too small and the leave form also didn't seem right for belonging to 'Pope John Paul II'. 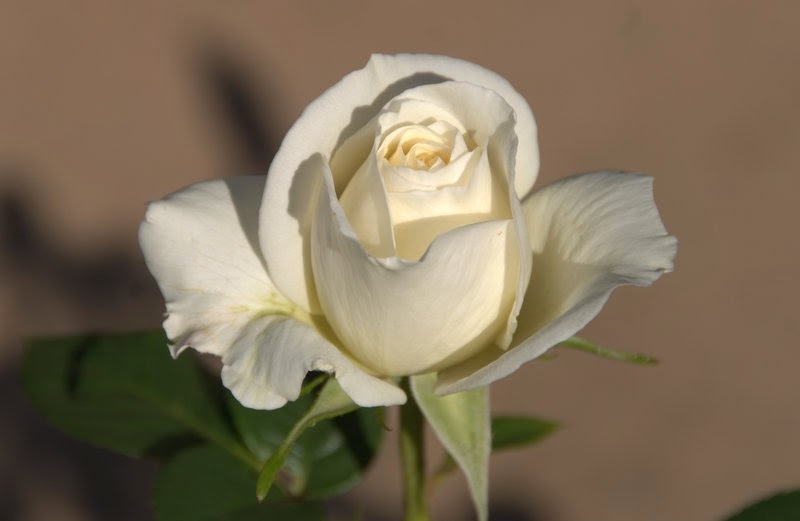 Then, as the rose bloomed the first time, it became evident that it this is a mislabeled rose. 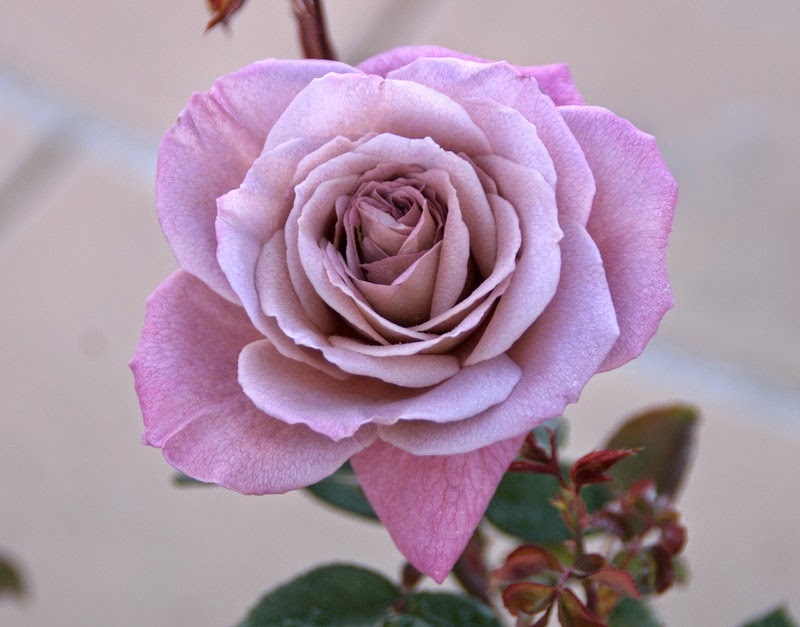 To me the blooms and the bush, even though still small, look much more like a Floribunda than a Hybrid Tea rose. 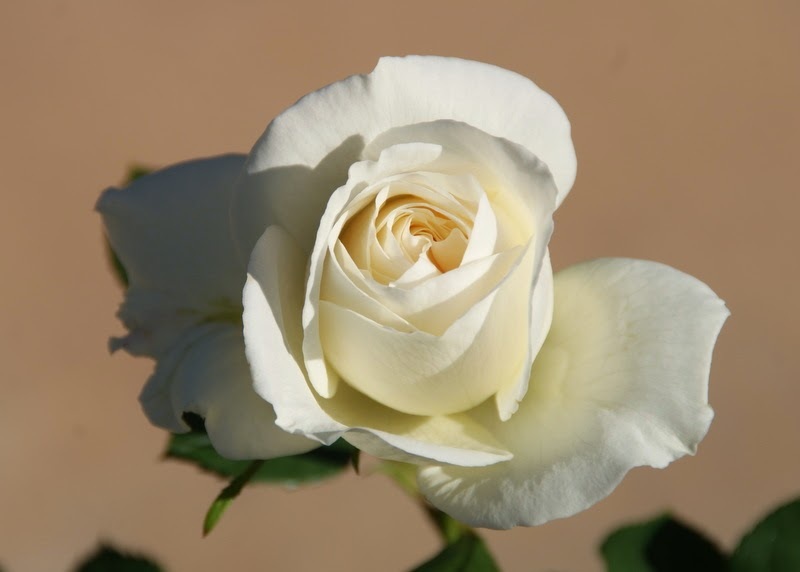 The flowers have a light yellow center, which 'Pope John Paul II' doesn't possess and they are smaller in size and different in shape. Nonetheless, they are really pretty and the rose has been very healthy so far, which is very important to me. I assume, that this is the variety 'Moondance', a Floribunda bred by Keith Zary (USA, 2007), which I believe Jackson & Perkins was also carrying last year. 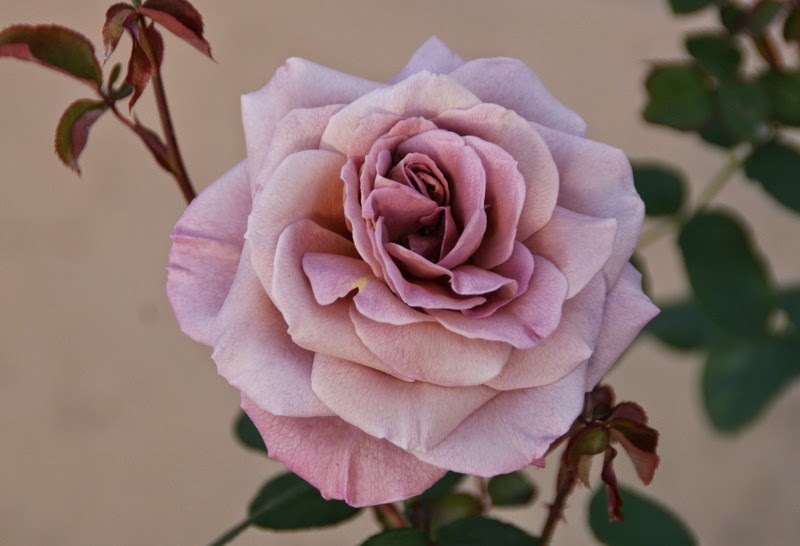 I am aware that it is very hard to identify roses, but if you have any opinions which variety this rose might be, supporting mine or differ from it, please let me know. I finish with a last photo of the my mislabeled rose. It is the same bloom like in the photo above, but again with the pool as a background. The dark blue background adds so much drama to this shot, I really like it. It never occurred to me before, but I think, it might be interesting to experiment with different background colors in the future, when I photograph my roses. Last but not least I would like to thank you for all the very nice comments that you left on my last post about Mottisfont Abbey Rose Gardens, it feels so wonderful to know when a post is well received! 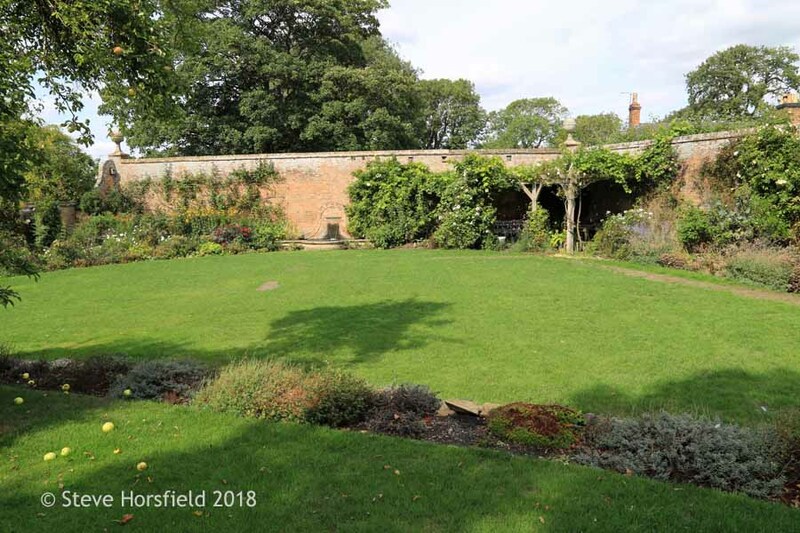 For me a nice way to celebrate my fourth blog anniversary, which was on January, 1st this year, is to post about one of the most famous and beautiful rose gardens in the world, again: Mottisfont Abbey. This garden is very dear to my heart and maybe you develop a soft spot for it, too. I posted about this garden already three times (for your convenience, please find the links to the previous posts attached at the end of this entry), but we are still in the second walled garden, which contains a lot of mature climbing roses fanned out artfully on the old brick walls. For many roses I couldn't find a name tag, but when I did, of course, I let you know. The photo above shows a well grown specimen of 'Celine Forestier', a light yellow Noisette, bred by Victor Trouillard (France, 1842). The rose collection at Mottisfont Abbey holds a lot of roses, that I have never seen in person, like this one. Besides the extraordinary beauty of the garden itself, this is part of the special appeal that it has for me. Another unknown to me beautifully grown climbing rose. Some of the climbing roses there were huge, like the one above. They really seem to like the sheltered conditions in the walled gardens that they are growing in. I always wonder, if the gardeners at Mottisfont Abbey do special stuff to improve the quality of the soil, to be able to grow such magnificent roses. 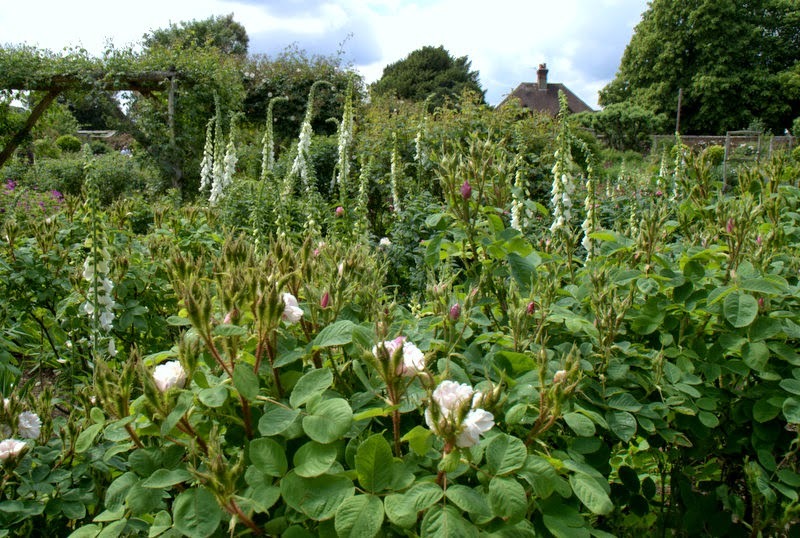 But not only outstanding roses are grown in Mottisfont Abbey Rose Gardens. There are also many fascinating perennials to be admired like this light yellow, almost chartreuse colored scabiosa variety, which I liked very much. Here is a shot of the whole plant. It is unusual tall for a scabiosa and needed to be staked, but it is such a lovely addition to the border. I liked this garden scene containing a tall pruned yew, yellow phlomis, lady's mantle and a cerise opulently flowering peony. 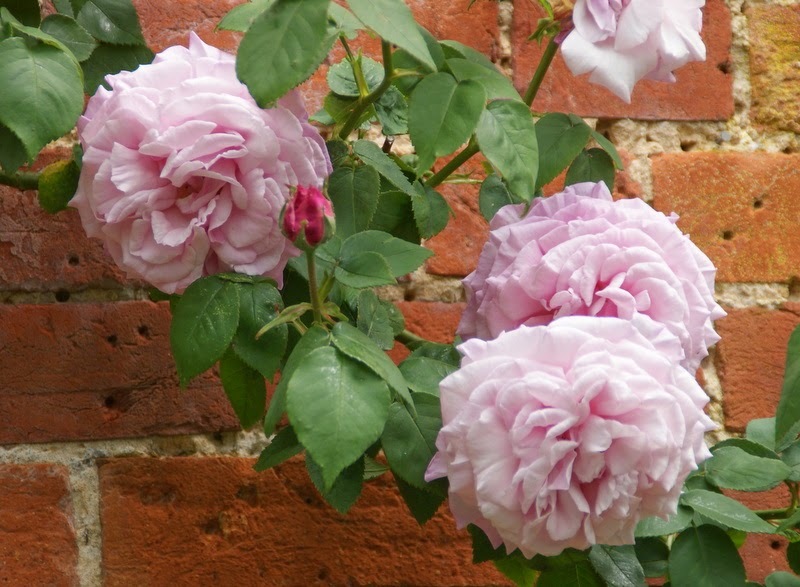 This is 'Climbing Souvenir de la Malmaison', a Bourbon, that was discovered by Charles Bennett (United Kingdom, 1893). 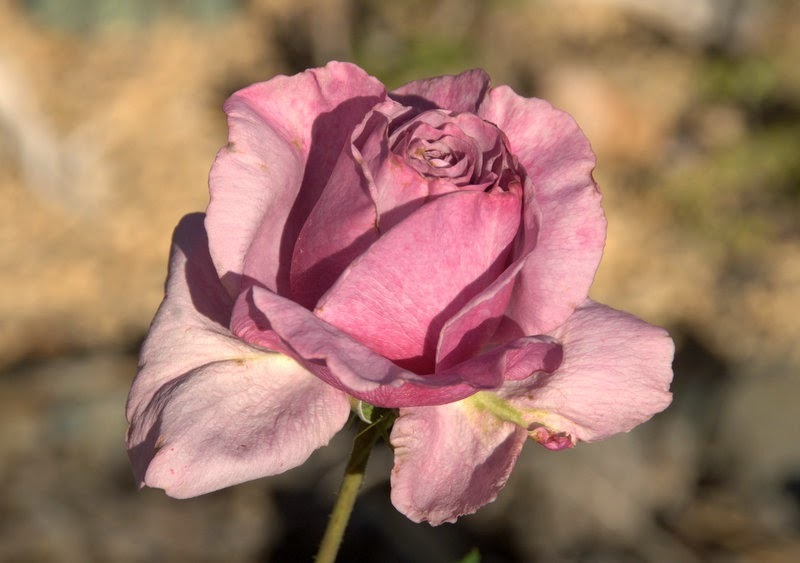 I always have been fascinated by this light, soft pink rose with the double, flat, quartered blooms and hope it is in my future to grow at least the shrub form by myself. Yet another shot along one of the walled rose borders. 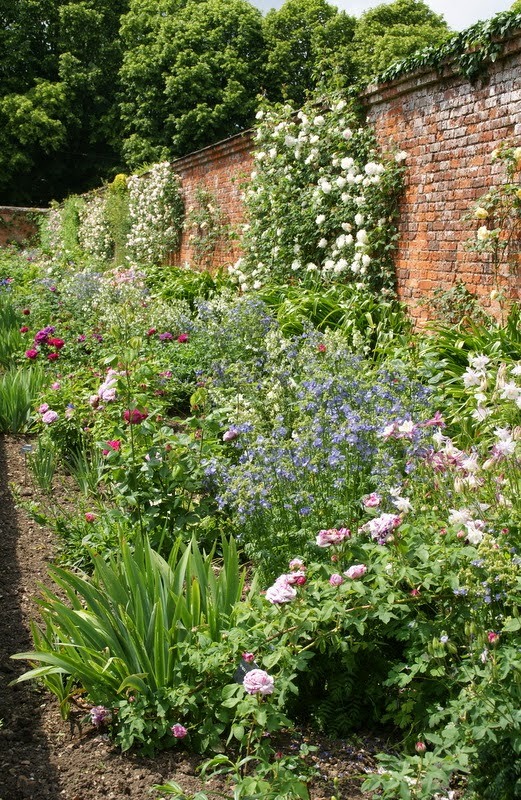 I love that at Mottisfont Abbey roses are not just grown by themselves, but they are shown off by beautiful perennials surrounding them. And the view is as lovely looking into the other direction. 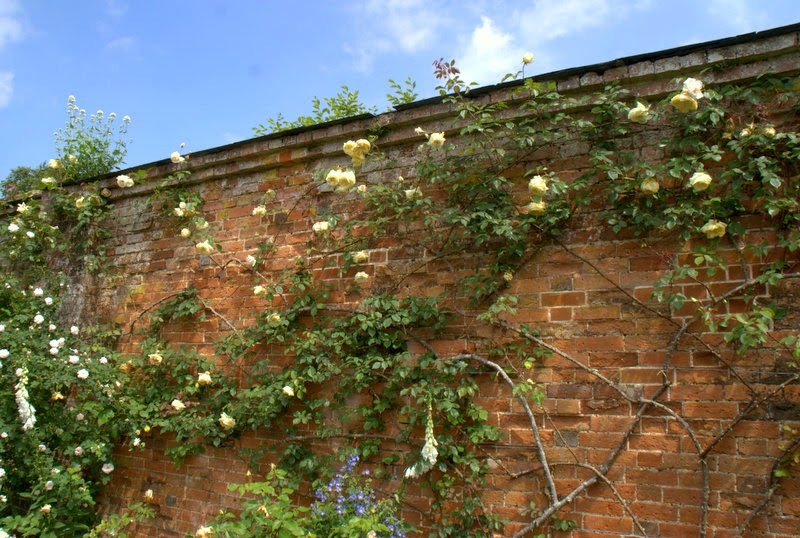 This climbing rose shows well, how professionally they are pruned and trained at Mottisfont so that the roses can show off their full potential when they bloom. I loved this color combination of the violet rose, the pink and white columbine (aquilegia) and the unknown to me blue flowering plant. 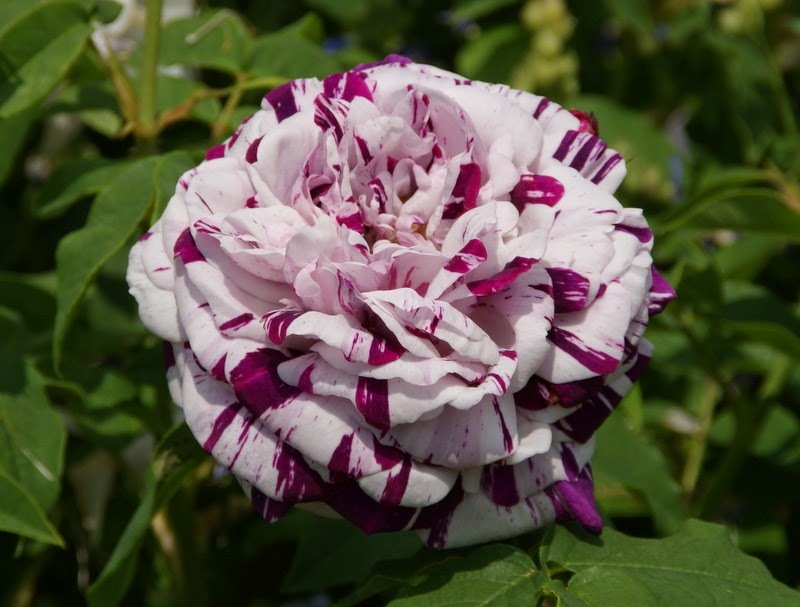 This beauty is called 'Oeillet Parfait', a lilac Damask, from an unknown breeder from 1841. Now, this is a rose that I hadn't even heard of before I saw it at Mottisfont. So exciting! I just love the color and form of the blooms. This rose seemed to want to bloom much later than the others that I am showing in this post and was full of hundreds of little cute buds. It must have been a great joy to see it in full bloom! Again, no identity for this one, but I love the burgundy stripes. 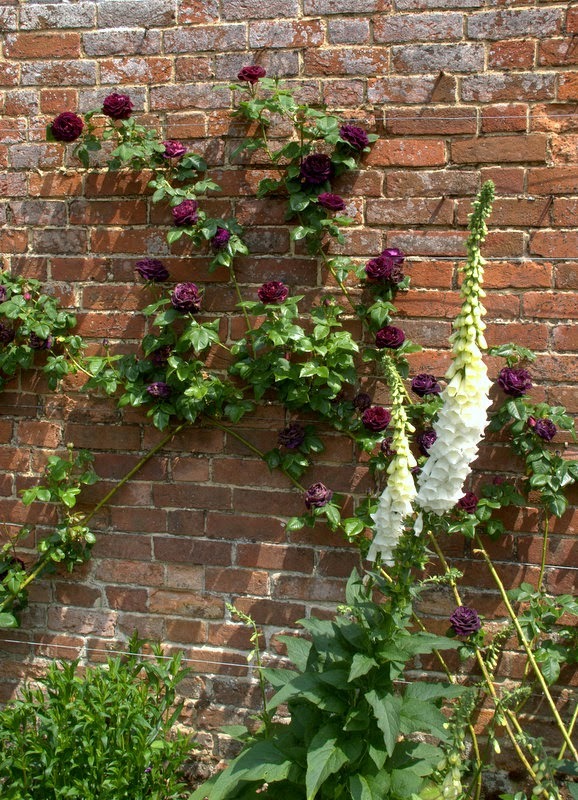 Another brick wall with climbing roses trained on it. As you can see many roses do fabulous in Mottisfont Abbey, but even there not all of them do equally well, just like in everyone else's garden. It is almost a relieve, isn't it? 'Mme. Isaac Pereire', a Bourbon, bred by Armand Garcon, is one of my most favorite roses. 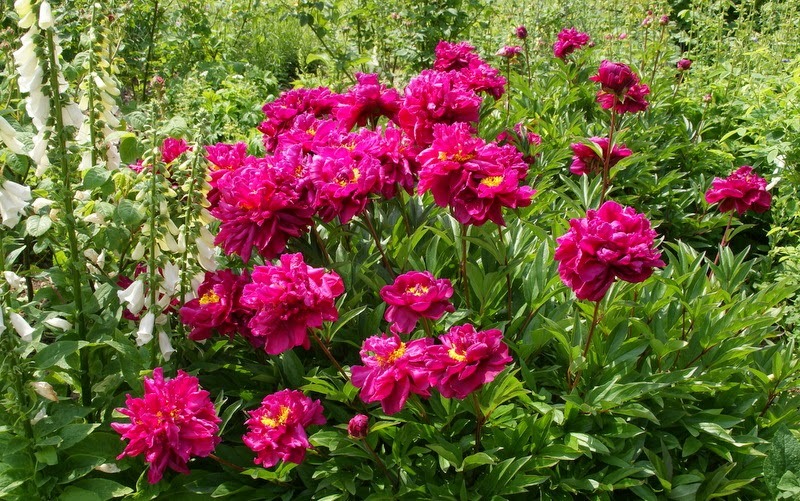 Its deep pink colored, sumptuous, large and very full blooms have an irresistible charm to me. But the real astonishing thing about this rose is its exquisite fragrance. If you have ever smelled the very strong, pleasing, raspberry fragrance of a bloom of this rose warmed by the sun, you will never be able to forget it. It is just one of the joys in live! One plant combination that I find particularly charming: white foxgloves, cerise peonies, and blue irises. Just wonderful! 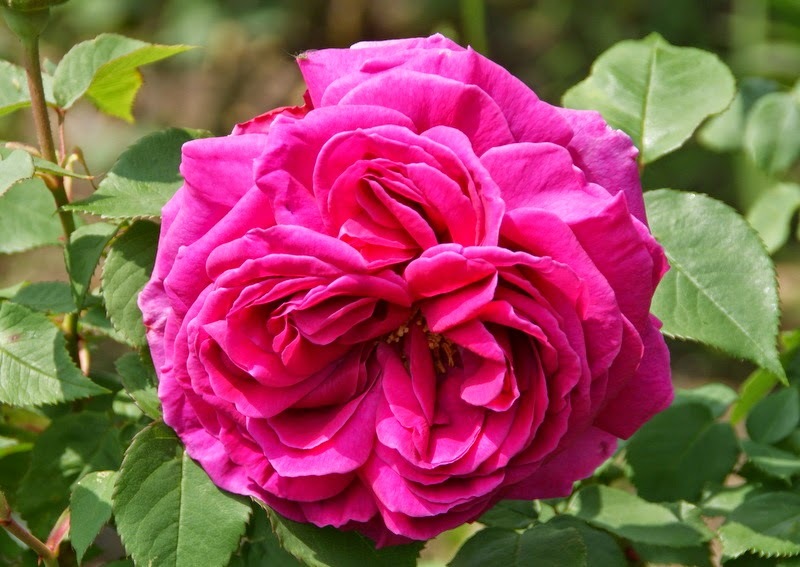 This rose, 'Souvenir du Docteur Jamain', a Hybrid Perpetual, bred by Francois Lacharme (France, 1865) was one of the roses that didn't thrive at Mottisfont Abbey Rose Gardens, but, oh my gosh, the color! One of the most exquisite shades of a violet dark red that I have ever seen. Completely captivating! My photo does not do this rose justice, it was so much more lovely in person. Another of the many beautiful peonies blooming in the garden. I really would love to know what the name of this rose is. To me it looks very much like 'Cl. 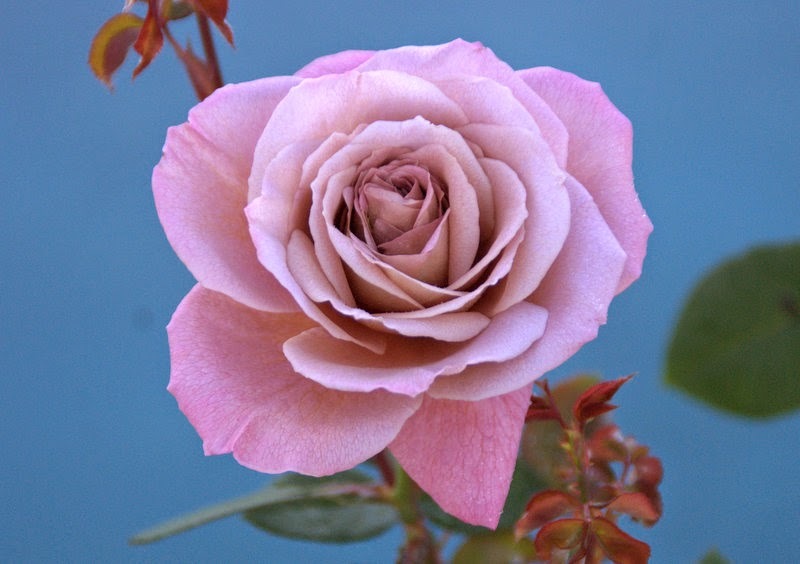 Devoniensis', a Tea rose that I grow in a container in my own garden. Here is a close-up of the blooms. Do you have any guesses? 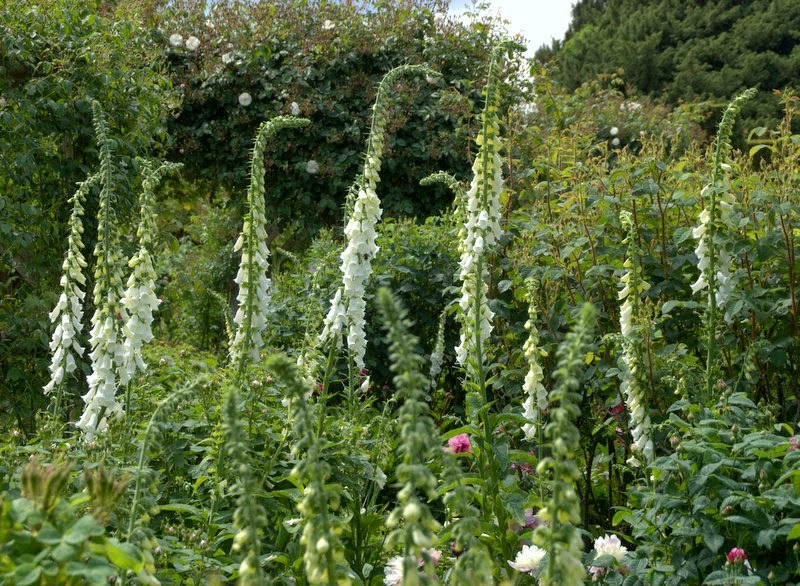 Not only roses were thriving at Mottisfont Abbey, foxgloves loved it there as well. I was so smitten by this white variety. It fits in everywhere and simply lighten things up in such an easy going way. 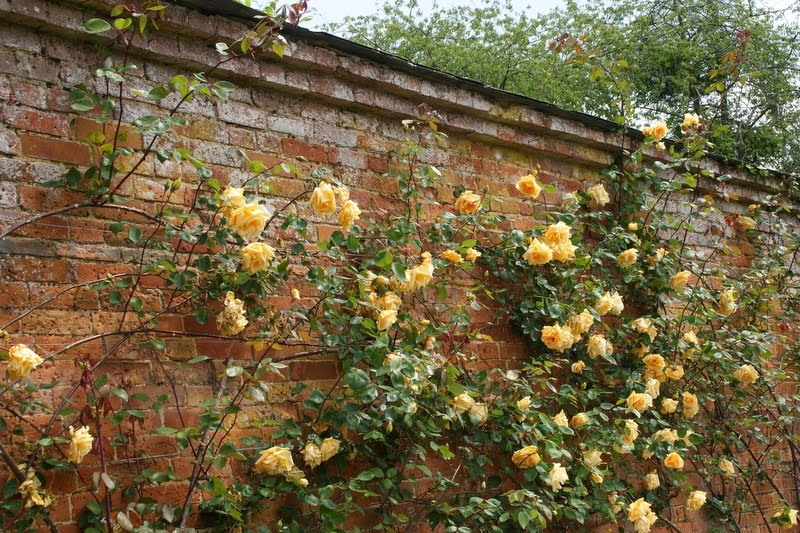 I think 'Climbing Lady Hillingdon', a Tea rose with large saturated yellow blooms, discovered by Elisha J. Hicks (United Kingdom, 1917) was one of the most elegant and impressive roses that we saw at Mottisfont Abbey Rose Gardens. Here is a close-up of the blooms of 'Cl. 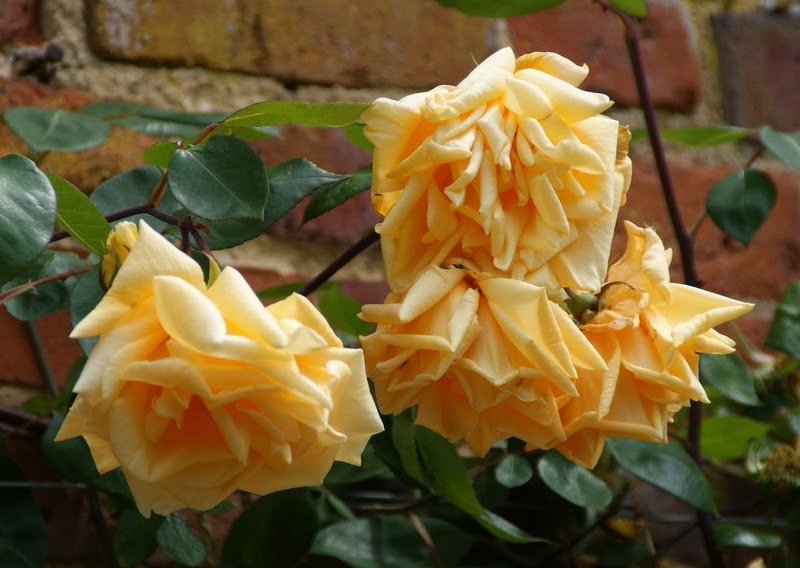 Lady Hillingdon'. You can clearly recognize the typical drooping bloom form of Tea roses with the edges of the petals curling backwards. 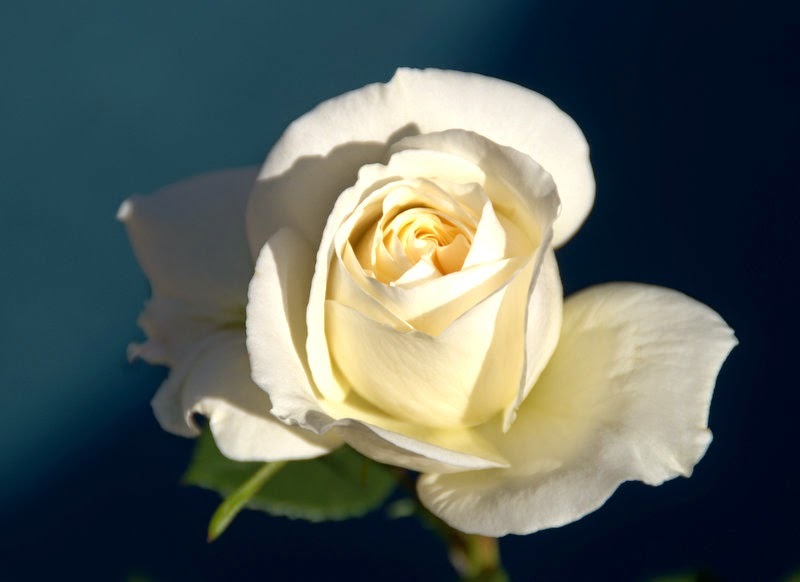 Unfortunately this flower shape is currently very much out of fashion, because many people prefer the upright Hybrid Tea flower shape as the ideal rose bloom form, but I truly hope, that Tea roses will have a comeback. Teas certainly have their very unique charm and beauty that deserves to be preserved and survive. One more shot of this gorgeous specimen of 'Cl. 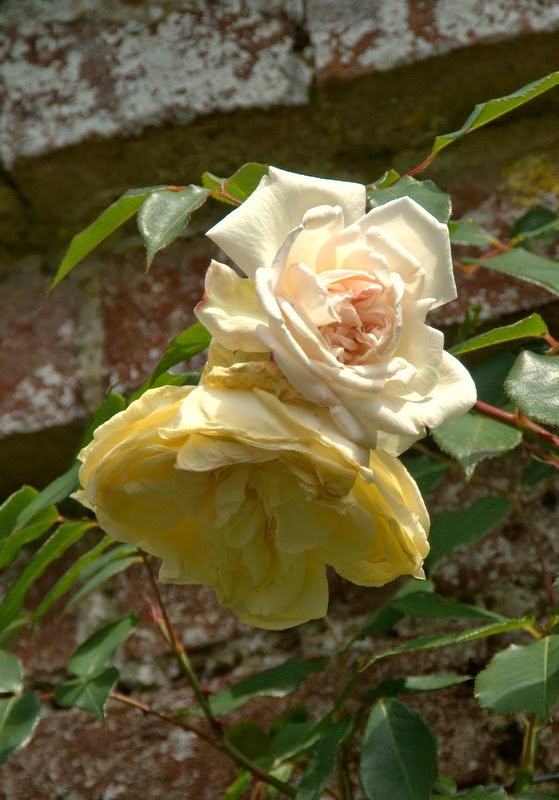 Lady Hillingdon'. Same rose as above, but photographed from the other side. 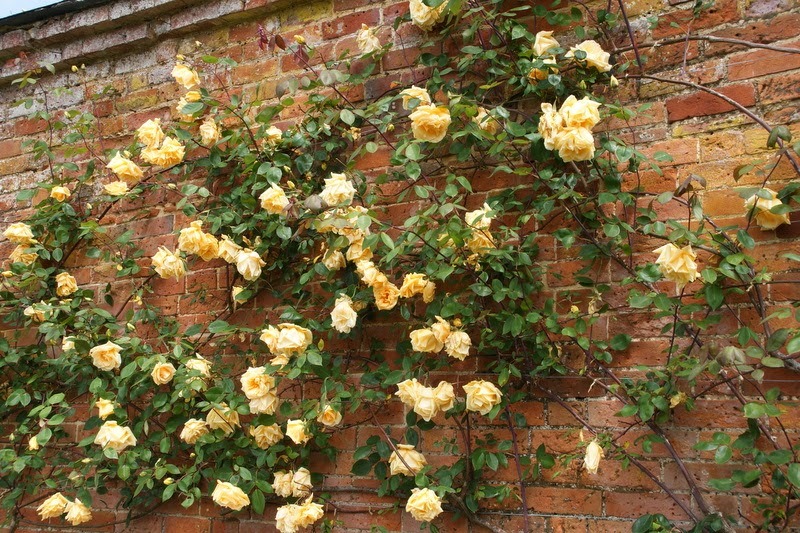 Another rose that I had never hear off before I visited Mottisfont Abbey is 'Mrs. 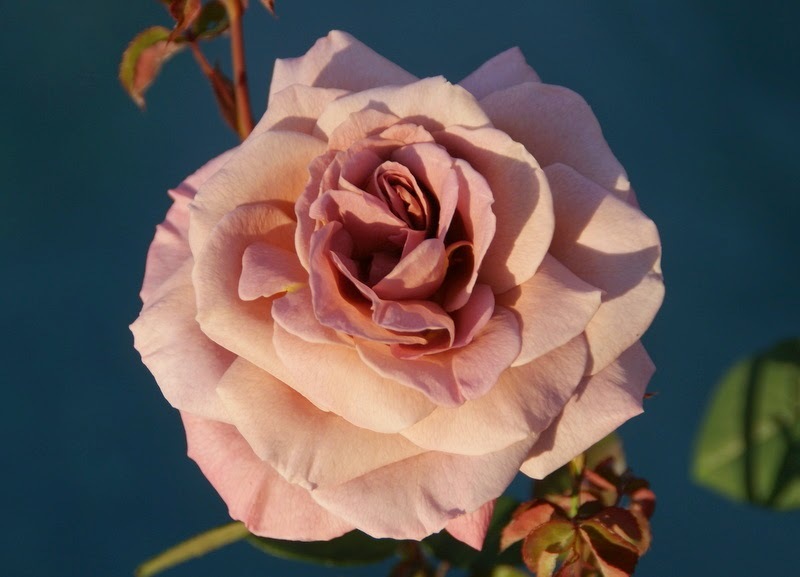 Paul', a light pink climbing Bourbon, bred by George Paul (United Kingdom, 1891). Not a vigorous rose in comparison to others at Mottisfont Abbey,..
...but the stunning large pale pink scalloped blooms make it totally worth growing. Since, as I said in the introduction to this post, my blog has just celebrated its fourth anniversary, I would like to take the chance and thank all of you my dear readers for visiting and also for all the kind comments that you have been leaving. They always make my day! I hope you will join me for another year of blogging. I am really looking forward to it!